Thank you to Cricut for partnering with me on this post and sending me the iron-on to create this t-shirt. This post contains affiliate links. Please read my full disclosure policy here. 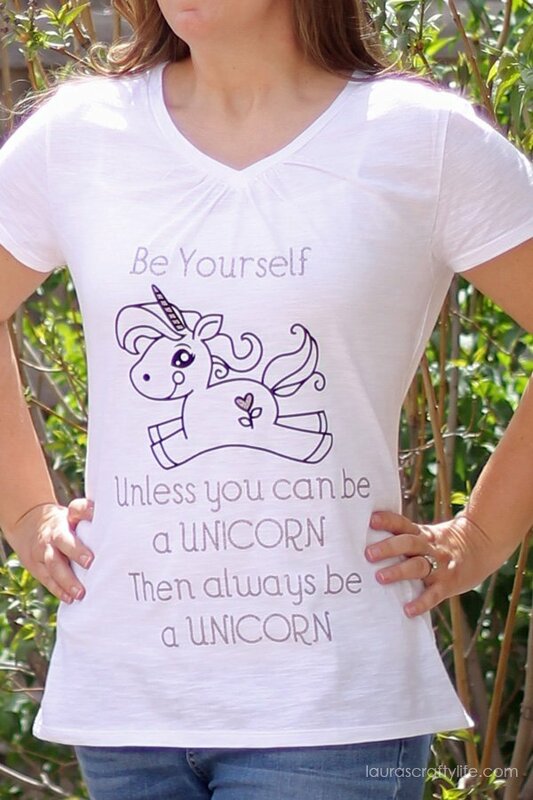 I was invited to participate in a Trendy T-shirt Challenge by Cricut. 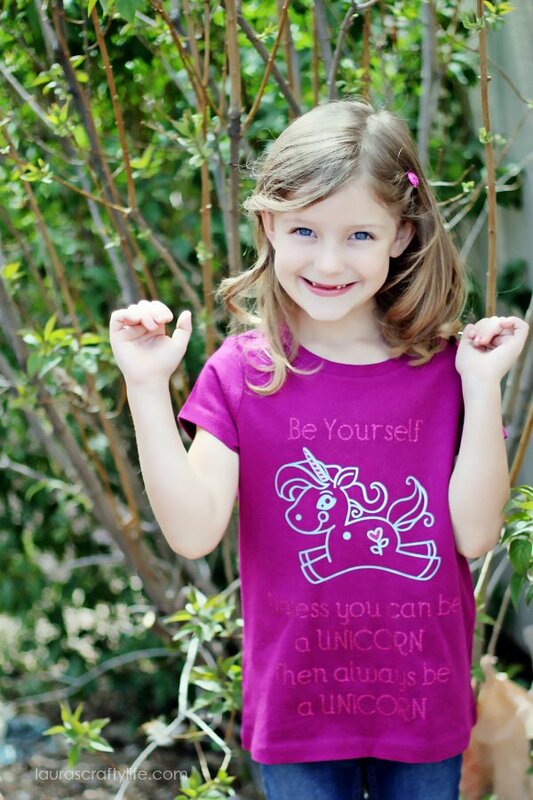 Several bloggers created t-shirts with new soon to be released images in Cricut Design Space™. 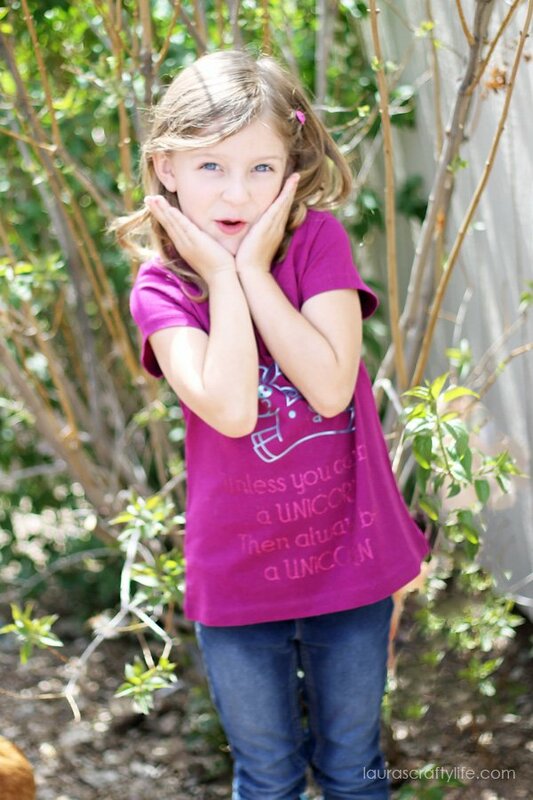 We were sent a preview of the images and the adorable unicorn immediately caught my eye. 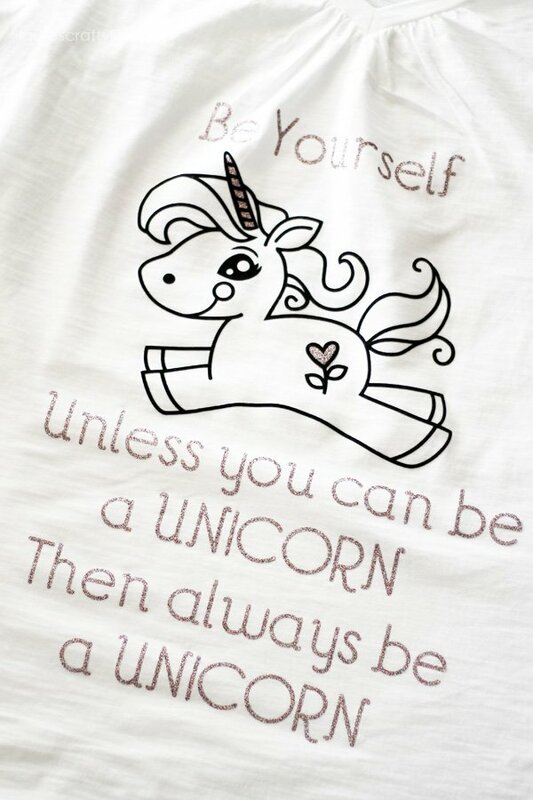 I have seen this saying about unicorns, mermaids, and even Batman before, and knew it would be perfect to pair with the unicorn design. As a funny side note, after I received access to the new unreleased images, there was a mermaid design that contained this quote! Great minds think alike. I was able to whip up this design in just a few minutes. I created two text boxes, added the unicorn shape, and then I added shapes underneath the unicorn horn and the heart so I could make those parts glittery. subscription, and I chose one called “Seaside”. Tip: To resize the design to fit your size: Open the file in Cricut Design Space. Click on ‘canvas’ in the layers panel and select the type of shirt and size you are working with. Choose ‘select all’ and use the arrows in the right bottom corner to adjust the image to fit your shirt on the canvas. Now, just click GO in Design Space and remember to click on mirror image for each mat when working with iron-on projects. Load your iron-on material shiny side down and cut out your designs. You then need to weed all the excess vinyl from your design, leaving only the part you will be ironing-on on the plastic. 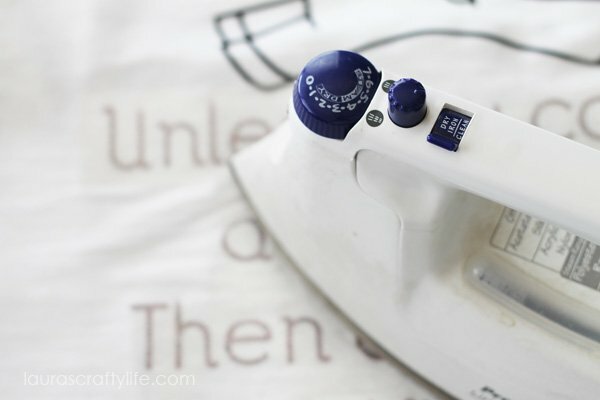 Set your iron to your hottest setting and iron each area of your design for about 25 – 30 seconds. Then flip your shirt over and iron on the back for 25 to 30 seconds. 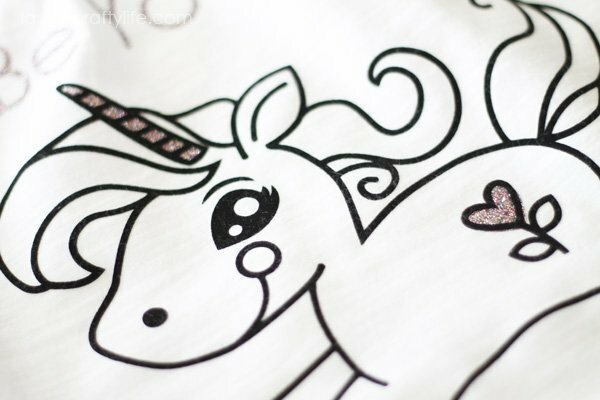 Note: I peeled the glitter iron-on shapes that went behind the unicorn’s horn and the heart and carefully placed them under the black flocked iron-on before I ironed everything down. This was the easiest way to be sure everything lined up well. Allow it all to cool for about one minute. Peel off the plastic and your shirt is ready to wear! 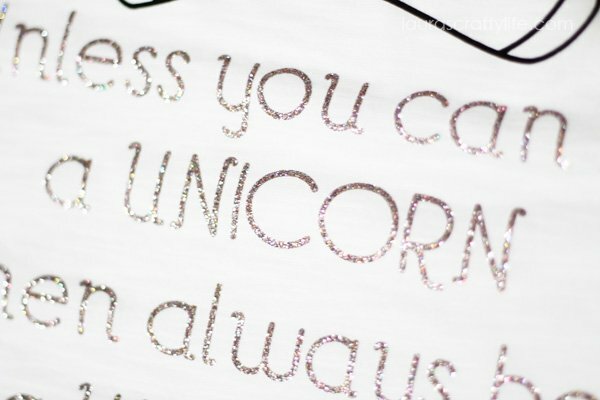 I LOVE glitter iron-on. If you haven’t tried it yet, you really should! The process was the same for doing both the adult and the child’s t-shirt. I simply chose different colors of vinyl. 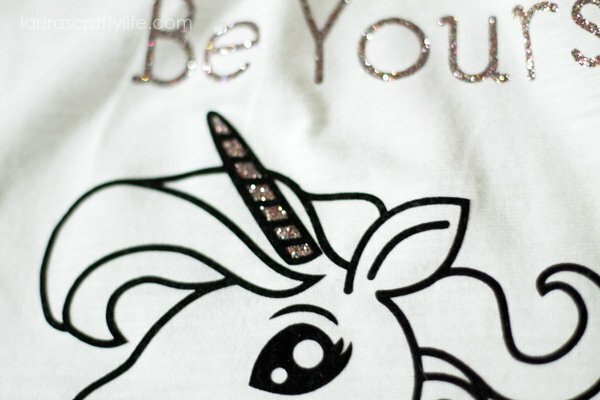 For mine, I used the Black Flocked Iron-on, which has a soft velvety feel to it, and Multi Glitter Iron-on. 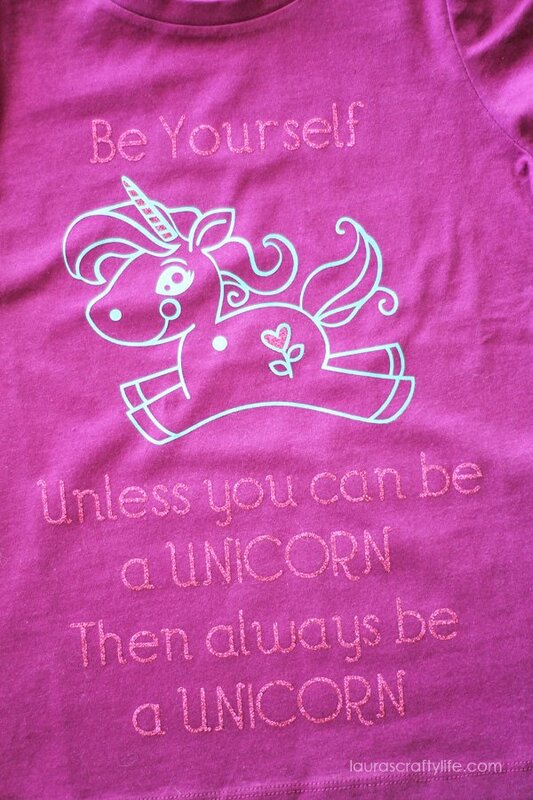 For my daughter’s shirt, I used Glitter Multi Pink and Aqua iron-on lite. 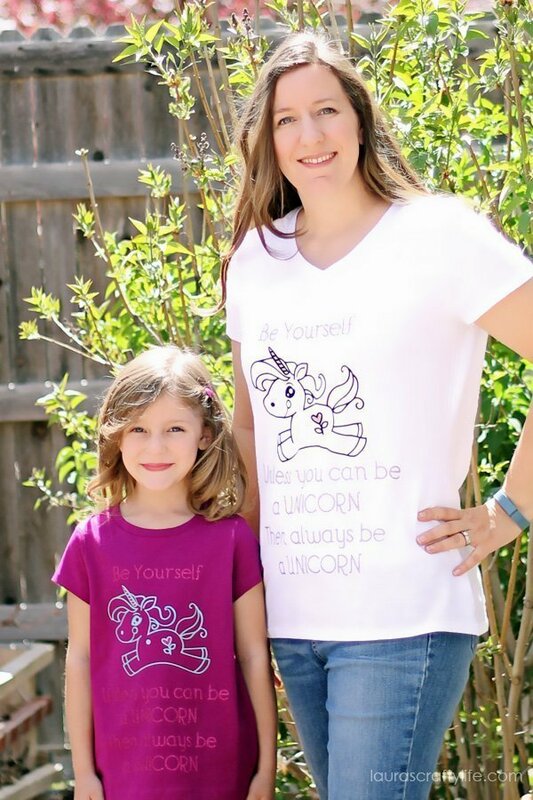 My daughter always says she wants to be “matchy-matchy” with me and this is a super fun and easy way for us to match! You’re both so cute matchy matchy! I love that you put bits of glitter vinyl in there- very smart! Thanks so much Steph! 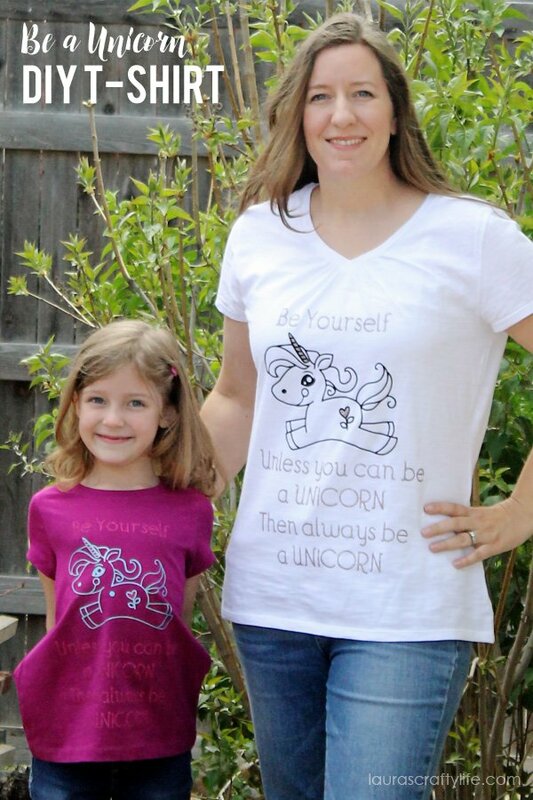 That is my daughter’s favorite thing – to be matchy matchy with mom. Have a great week! Thank you Katie! Have a great week.